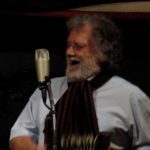 On the wee hours of Sunday, 5 March in Daylseford, Victoria, Australia, the tour de force Danny Spooner passed away from liver cancer. 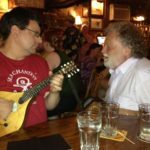 He was a friend to all who took a moment to speak with him and an encyclopedia of folk song and story that was mesmerizing even in a crowded pub. He is survived by his wonderful wife Gael. 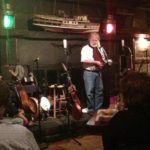 Danny came and performed at a Sea Music Festival in Mystic, Connecticut and simply blew me away! 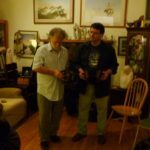 Since that day that I first met him and the following year that he return – including an explosive performance at our Survivor’s Night – he gave me an adrenalin boost to my performances and understanding of the genre. He took an entire day out of his schedule to sit on my porch sipping grog and helping me break my mental block on using the concertina to augment my singing, and we shared our obsession with the expression by song of the common working class and the usual misunderstanding of the topics and approach to the music by those who prefer to have their folk music “gentrified”. He took me by the hand and said that what we had just gone through has made us “blood brothers” which he reiterated at his last visit to our Monday nights at the Gris in August of 2013 – an honour that I had taken to heart and still hear his voice in that emotional moment. Over the next 10 years he held various jobs including salvage tug and trawler skipper. This varied, almost nomadic life, has given Danny an all-too-rare real-life education in the ways of working people. Car-LivingJust-arrived-in-AustraliaWhen Danny arrived in Australia in 1962, he realised that there was an audience ready, interested, and willing to appreciate these sorts of songs. 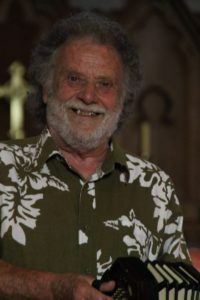 He heard Declan Affley singing in the early folk scene in Sydney, and at the fabled Frank Traynors in Melbourne Martyn Wyndham-Read, Brian Mooney, David Lumsden, Trevor Lucas and Margret RoadKnight. This was the engine room of the folk revival in Australia, and made Danny want to learn those songs. From Wendy Lowenstein and Gwenda Davey he understood the importance of the social context of the songs and proper attribution. 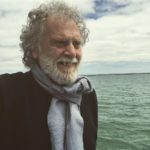 Thanks to a prodigious memory and a willingness to learn about his craft, Danny Spooner quickly developed into one of the best singers of British folksongs in Australia. 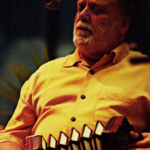 Over the years he has augmented what he learned “on the job” with a vast repertoire spanning almost every part of the British tradition – as well as a respectable portion of the Australian folk heritage. He’s been please to add American material learned from new friends – and even a Canadian-French whaling song. 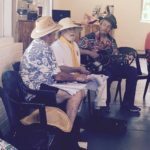 National-Wool-MuseumDanny has performed in folk clubs all over Australia, New Zealand and in Britain on his visits home. 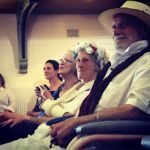 He has appeared at every major folk festival in Australia, at which he has given a vast range of workshops on aspects of folk songs of Britain and Australia. Many of these presentations were recorded live by ABC national radio. His passion is getting people singing, and he has inspired and encouraged many in developing their singing craft. 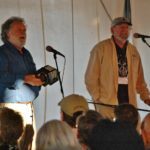 Nothing gives him more pleasure at a festival than getting a good singing session going, “That’s what folksong is about”. 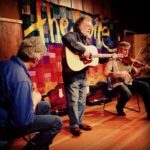 Long described as “a living national treasure”, Danny Spooner can make traditional music seem new and make new songs seem old. 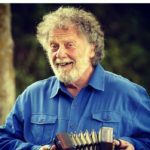 “Danny Spooner has become a part of the living Port Fairy Folk Festival tradition since its inception in 1977, and it was our pleasure to invite him to be the guest of honour as inaugural Artist of the Year Port Fairy 1995. Round-Robin-Port-FairyHe’s as permanent a fixture at Port Fairy as a bollard on the wharf beside the River Moyne. 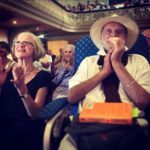 For 20 years, the audiences have enjoyed his workshops, one-man shows, his deep multi-disciplinary understanding of social history, and his immense repetoire of songs. His songs cover the full gamut of human emotions, endeavours and experiences. 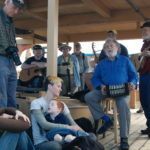 Shanty-Session-Port-Fairy Legendary is his wharfside shanty session where you can follow a sea journey in song, sing the work songs that raise the sails; but beware, if he sings about reducing the sails, the chances are he’ll sing up a storm. We hope it is seen by all as an honour and indeed it is one that Danny richly deserves. Such a unique talent and commitment shines, and Danny has never been short of invitations to perform. 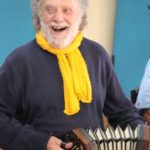 Not just folk music – he can lecture on history, music, folklore… and did you know he could act. Click here for the obit and remembrances on Mudcat. 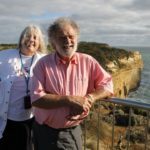 2016 – Janet Buck-Marusov and Danny in Australia. 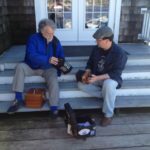 At the Griswold Inn, June 2013, Danny and Jos working out a song to perform – photo by Donna Goodspeed. 2013 Mystic Sea Music Festival – photo by Gene Cartagena. Danny leading the room in “Drink Good Ale” – Survivor’s Night, 10 June 2013. First lesson in the “Danny method” at the Mystic Sea Music festival, June 2012 at a stolen, quiet moment. Photo by Donna Goodspeed.